Strategic Planning…it’s better than you think. Yesterday, we had the daunting, but incredibly rewarding task of having our board retreat in order to fashion our strategic plan for the next five years. On one hand, I was overwhelmed by the amount of work that lies ahead…on the other, I was blown away at what we have accomplished over the last year to put us into a position where we felt the need to have a 3-5 year strategic plan! We decided several months ago that a “board retreat” was in order, as we are a working board…a hard working board. We needed to set aside some time, outside of the day-to-day operations to discuss where we are going, and how we are going to get there. Sadly, due to tight schedules from all of the board members, we didn’t realize the dream of Margaritas on the beach after a long planning session, but we were incredibly well taken care of at 4 East Madison Inn. Having someone else feed us (and did she ever!) 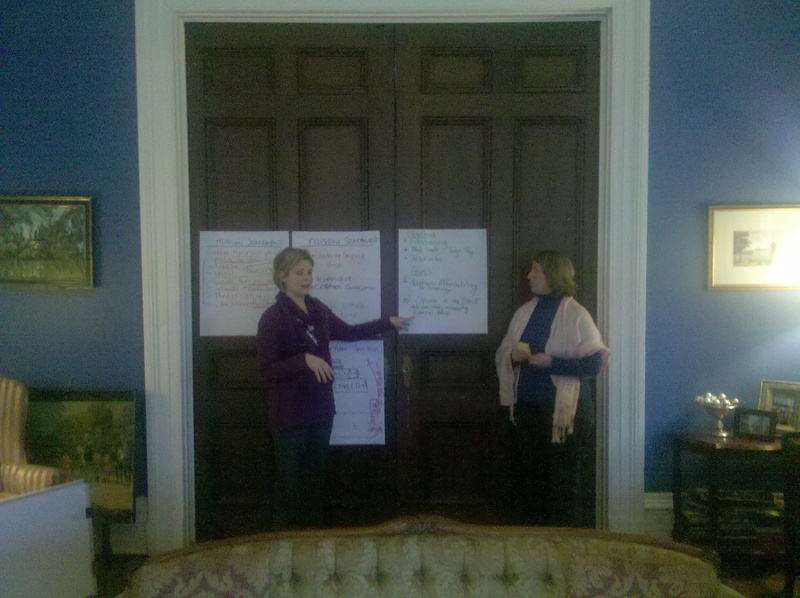 and allow us to use an extraordinary space for our meeting, really allowed us to focus on the tasks at hand. Many thanks To Sandy Lawler for making all of the arrangements. We are an organization with some lofty goals, and with a board that is comprised of some of the hardest working people that I know. I am certain that these goals (even the BHAG’s Phillip!) can be met on schedule. Having a day to focus on the “big picture,” was very worth the time and effort. Making sure that in the day to day details, we are all focused on the same long-term goals, is crucial to our success. All in all, I continue to be humbled by the amount of time and effort that people put behind this project. I’m terrified, excited, and downright gleeful about what is around the corner. We all found it incredibly interesting that the morning after our meeting, Tim Smith with the Baltimore Sun had this post on his blog. Baltimore Concert Opera presents opera in a format that highlights the human voice. By removing the artifice that separates the audience from the performers, BCO creates an experience that is intimate and affordable, that captures the core essence of opera, and that is unlike the overly visual trend of the industry as a whole. In this way, BCO endeavors to create new fans of the art form while giving existing fans an entirely new experience. Many thanks to those of you that continue to support what we do. Please continue to spread the word about our upcoming performances and events…continue to volunteer…and oh yeah, continue to send money! All the best wishes for a 2010 that is full of happiness, prosperity, and wonderful music! This entry was posted in Uncategorized and tagged Baltimore Concert Opera, Baltimore Opera, Baltimore Sun, Strategic Planning, Tim Smith. Bookmark the permalink.